You could get high on this menu. And not a sip of alcohol need be summoned. Podi idlis make an entrance suspended on tall skewers. The risotto arrives hidden in a white tower tall enough for Rapunzel. And a spicy red curry paired with steamed rice dangles daintily from twin steel buckets. This last one is so elevated, it insists you stand up to get a peak inside. ai?? ?We wanted to bring a little bit of theatre into our presentation,ai??? 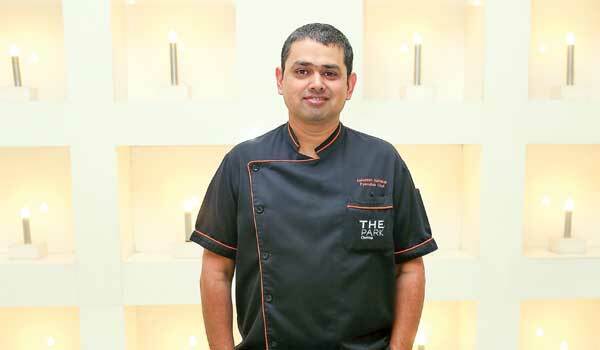 smiles Executive Chef Ashutosh Nerlekar, of The Park Chennai. Lunching at the launch of the new 601 menu, there’s no need for red curtains to drop as we welcome a serving of Red Snapper. Aerial plating raises the bar on anticipation, sort of like foreplay. Of course, this puts a lot of pressure on that first bite. The Lobster bisque with lemongrass foam set an impressive tone on that front. This was quickly followed by juicy prawn skewers marinated with salsa verde and lemon aioli. Blackened fish tacos with little dollops of sour cream and a beetroot carpaccio salad with orange segments and roasted walnuts. The latter was so pretty, it looked like a pocket-sized garden on a plate. dumplings with potatoes, dal makhani and butter naan. And we couldn’t rave too much about the risotto roulade either, which came with Poitou goatai??i? ?s cheese, roma tomato and red pepper sauce. Perhaps our expectations got a little carried away after Chef Ashutosh reminisced about fusion experiments at Saint Lucia, in the Caribbean. He recalled a particular dish with ai?? ?salmon and goat cheese upmaai?? ?, and now we can’t stop thinking about it. We saved the best for last though. If youai??i? ?re on a date and your girlfriend is taking an eternity to decide ai??i?? here’s what you are mandated to order. (You may thank us later.) The barbecued baby back ribs are for the meat lover. Itai??i? ?s an obvious choice if seek out pork on a menu, and as a bonus, it comes with a side of bacon popcorn. On the other hand, if you’re feeling more in the mood for a spicy curry, the red snapper ai??i? ?en papillote (French for in parchment) in a fiery red pepper curry will have you going back for seconds. ai?? ?This dish is interesting, because itai??i? ?s a desi dish put together with a French preparation,ai??? adds Chef Ashutosh. By this point, we are packed to the rafters. But to miss dessert would have us regretting it all the way home. Between deconstructed passion fruit tarts and Valrhona chocolate marquise with a bed of red velvet ai??i?? weai??i? ?re mighty glad we hung in there.Ai? ?Average cost for two Rs 2,300 (inclusive of taxes). Details: 42676000.